The practice of Tai Chi will change the way a practitioner walks. This video describes how. A webpage duplicate of the video is also provided for those who prefer reading and for more leisurely study. A human being should be standing vertically straight as shown in this picture. leans forward so they look like they are about to fall to the ground. 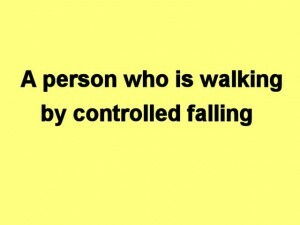 it would be natural for the person to put out their arm to control the fall. The arm will prevent the person from falling all the way to the ground. 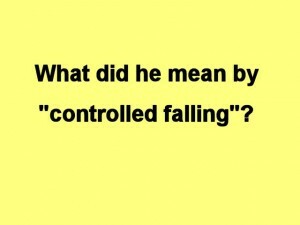 Here is the picture representing controlled falling with the person leaning forward about to fall down. in the same way the arm is put out in front of the body to stop it from falling. The extended leg has the same look as the arm extending out in front of the body. Here is the picture of a person standing vertically straight. 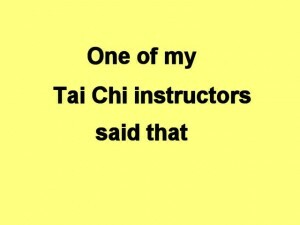 One of the goals of Tai Chi is to teach the practitioner to always keep their weight on one foot when they move. A Tai Chi practitioner is always balanced on one leg when they move. Tai Chi trains the practitioner to lift up one leg and place it in a new position, while the other leg is held balanced, solid and steady. After the moving leg reaches it’s new position, the Tai Chi practitioner moves his weight forward onto that leg until he is securely balanced on it. Then the rear leg is lifted and brought into it’s new position. 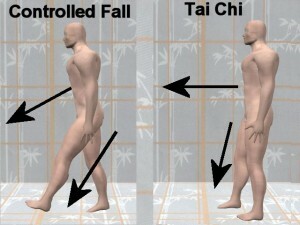 This picture compares controlled falling on the left with Tai Chi walking on the right. 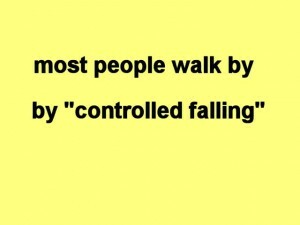 The leg of the person who is walking by controlled falling must be extended out at a large angle to prevent the person from falling. In contrast, because the Tai Chi person is balanced on one leg, the other leg can freely move about to search for the best place to settle without any fear that the Tai Chi person will fall.